“Prepare to play at least 20 rounds in 14 days to have even the slightest possibility to beat me”, said Robert “Robban” Andersson to motivate his challengers before Golf GameBook’s Beat Robban challenge started on Monday 1st of September. One man did that, played exactly 20 rounds in two weeks and beat both Robban and all other GameBook users. Fredrik Bergdahl from Romeleåsens Golfklubb was the clear winner of the challenge after taking an impressive homestretch during the last five days of the competition. Robban, the man to be beaten, played 15 rounds all together and was the solo second, five rounds behind the winner. A day before the challenge begun, Robban suffered from a water damage at his home and couldn’t play as much as he might have done without the incident. But in one unofficial category Robban was unbeatable. He was the only player in Sweden that played at least 18 holes every day during the given period. Bergdahl missed one day, Sunday the 7th, when he was watching a Ladies European Tour tournament in Helsingborg with his family. There were 11 other players that reached the limit of ten rounds. Among them, with 12 rounds played, was Daniel Eriksson from Mjölby Golfklubb. He was drawn to be a winner of the category 2 in the competition. GameBook will cover the “golfing expenses” for Daniel, Fredrik and Robban with Nike Golf products as promised. Q: How and when did your hear about Beat Robban challenge? Fredrik: I read about it on Facebook when I saw you made an article about Robban. I have played with him 5–6 times over the years, so I know how much he is playing in a year – which is very impressive. We’ve actually played bowling against each other also, but that’s another story. Q: Did you think that Robban could be beaten? Fredrik: At first, no. My goal was to play 10 rounds. I expected Robban to play 20 rounds and thought that it would be too much. First week, I played seven rounds from Monday to Saturday so that I could easily reach the limit of ten rounds. On the Sunday I didn’t even play, because I was with my family at Helsingborg Open. Q: How did you react when you heard that you are leading the competition? Fredrik: When I saw I was one ahead on Wednesday, I told my family about this and said that if I played double rounds every day, I could win. And I really want to thank my family, Therese, my wife, and Linda, 9-year old daughter, who supported me and said that I really should do this once-in-a-lifetime challenge. Also thanks to the friends who supported me. Q: You had obviously set up a goal to play 20 rounds, is that right? Fredrik: Yes, but actually this goal wasn’t set up until on Wednesday in the second week of the competition. On Tuesday, I only had time to play one round. So, when I saw I was in the lead, I aimed for 20 rounds. It was a bit fun though that it was exactly the number, what Robban said. Me and Robban are also GameBook friends, so I saw that maybe he wouldn’t reach 20 rounds. But I knew that he would play 15-16 rounds, so it would be tough for others to beat him. It gave me some extra boost to be a single winner of the challenge. Robban beat me with one shot on a 36-hole competition on Vellinge GK, so I thought I would give it a go again competing against him. Robban is the king of playing many rounds. It’s very impressive that he plays every day, so it was lucky for me that the challenge was only 14 days. Fredrik Bergdahl (behind) knows Robban from the past and got now his revenge after losing earlier to Robban by one stroke. Q: How did you find time to play this much golf in two weeks? Fredrik: Well, I would prefer to have a job that I like, but unfortunately I haven’t had any success in getting one. So, I played as fast as I could and then spent the evening/night to send my job applications and checking jobs with my smartphone on the course. Not much sleep during these two weeks, but golf makes me spirited. I would like to work as an administrative assistant, delivering things, software tester (found one bug from GameBook app for Android, but your support took care of it very good and now it is fixed) or updating web sites. I have also published a children’s book, “Hubert den rosa krokodilen” (Hubert the pink crocodile). Q: How did it feel to play two rounds in a day on five consecutive days? Fredrik: This was something I’ve never done before. When I had set up my goal and knew I would play two rounds every day, my mind was focused on 36 holes in a day. 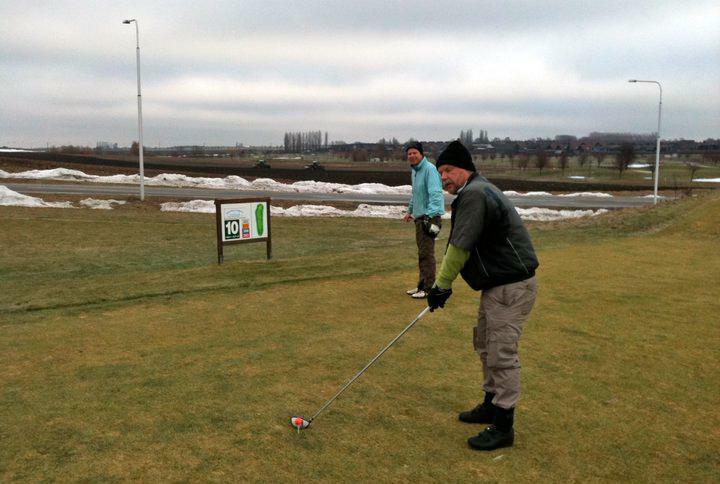 So when I had played the first round, it just felt like, “lets go again”, especially because the weather was good. Some morning, my body was a bit tired, but when I stood on the tee, I always wanted to play. In the second week I played more and more solid and I really got my swing working. I kept my game on the same level for 36 holes every day as you can see on my results. Four times I was close to hit a hole in one, for example. The last day it was very windy and tough, so I was very pleased when I finally reached my goal. And today I will not play, for sure! Q: Did Beat Robban Challenge motivate you to play more than normally? Fredrik: Yes, it was great to have this extra challenge once in a lifetime. I’m always up for “crazy” golf challenges. 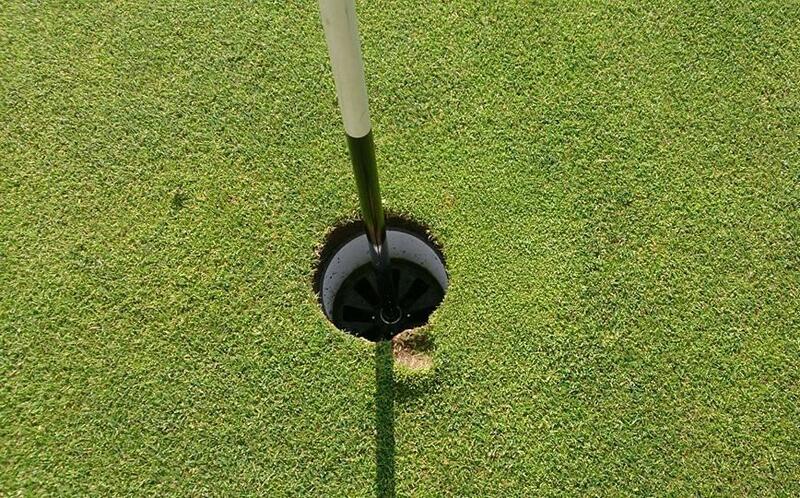 Fredrik Bergdahl was this close to a hole in one in one of his rounds.